Playing at the Havana Theatre March 13-23. What if JULIET doesn’t kill herself?! Juliet: A Revenge Comedy follows Juliet as she tears herself from the pages of the narrative determined to alter her fate. With dagger in hand, Juliet wanders through the cannon and recruits a team of Shakespeare’s renowned female characters to confront their creator: William Shakespeare himself! This comedic adventure follows Juliet on an epic journey, as she reclaims her possible (fated) demise through quill fights, witches and a climactic battle! Written by first time Monster PIPPA MACKIE and RYAN GLADSTONE. Starring long-time Monster CARLY POKORADI as well as Pippa and Ryan. Keep following Monster Theatre for lots more info about this exciting project! THEATRE UNDER THE GUN was a huge success! A massive thanks to everyone who came and partook in THEATRE UNDER THE GUN on February 9th. Here are some awesome pics. No Tweed Too Tight: Another Grant Canyon Mystery is headed to the Astor Theatre in Liverpool, Nova Scotia. It’s been almost five years since the last Canyon tour, and boy is he out of shape! If you know anyone around Liverpool Nova Scotia, then send them this way for some laughs. One of our very best is playing two performances at the Havana Theatre before heading on the road to Nova Scotia. The Betrayed wife. The Scheming wife. The Peacemaker. The Ugly German. The Slutty one. The One in love with someone else. Six Queens. Six Love stories. Six Deaths. One Actress! ANNOUNCING THEATRE UNDER THE GUN 2019 COMPANIES! 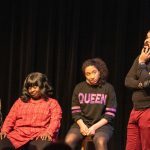 Dope Hearts Theatre is a brand new theatre collaboration for Black creatives. Born from a shared vision to see more Black voices on our stages, we are a group of melanin poppin’ artists who’ll be teaming up for the first time at Theatre Under The Gun. 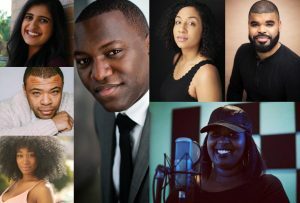 For this 48hr showdown our artists consist of Celia Aloma, Mariam Barry, Missy D, Chris Francisque, Omari Newton, Donald Sales, with Gavan Cheema as our director. This will be the first of many exciting works from Dope Hearts Theatre. So come ride with us in celebration of a new and electric voice to our theatre scene. Dope hearts. Dope theatre. Jackie Blackmore, Susanne Moniz de Sa, Yumi Ogawa, Laura Jaszcz, Catherine Falkner. 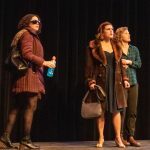 Tight Corset Theatre Company was formed in 1999 as a platform to foster and support women artists to write, workshop & produce original comedic theatre works. 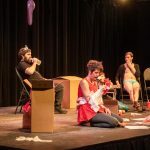 Veteran performers of the Vancouver & Victoria Fringe Festivals and Theatre Under The Gun, their award-winning past shows include Saucy Bits, The Good Time Girls, Dumb Blind Luck, Awkward & Ways to Woo Enrigué. 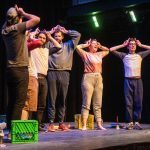 Since its inception 4 years ago, Sour Dog Theatre has produced over 50 improv shows (including 4 original formats), 2 Canadian Fringe Festival runs, The Canmore International Improv Festival, and 4 scripted play productions. 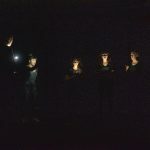 Our mandate is to create work that explores what connects and disconnects us as human beings. With a strong value for honest storytelling we are constantly on the search for universal truth within the human experience. We strive to create theatrical experiences that are playful, poignant and professional, whether it be improvisation or scripted work. 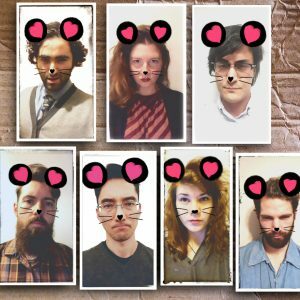 ‘Your Favourite People’ is a collective of award winning professional theatre artists who are excited to collaborate fast and furiously on this project. 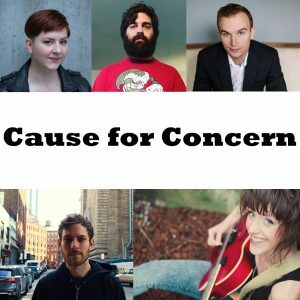 Cause For Concern is Valerie Cotic (new best friend), Al Lafrance (Thunder Blunder), Devon More (Devon More Music), Jeff Leard (Active Salad), and Cory Thibert (May Can Theatre). We are an ad hoc group of artists with different artistic backgrounds from all across the country who met on the Canadian Fringe circuit and all eventually ended up being neighbours here in Vancouver. New TYA play under construction! 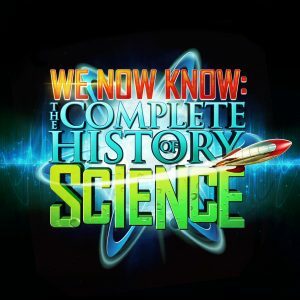 WE NOW KNOW: The Complete History of Science is under construction! Writers Peter Carlone and Ryan Gladstone have been hard at work, periodically, for almost 4 years. It turns out that converting complex scientific material into entertaining, clear, fun material for young audiences isn’t as easy as it might sound. But “sciencing to do they did!” and with the script finally complete, we are ready to launch into production development. Thanks to generous support from both the BC Arts Council and the City of Vancouver, we’ve been able to conduct a series of workshops to test out the material. WE NOW KNOW is jam packed, like protons in a nucleus, with projections. While co-writer Peter will be handling a lot of the animations, local artist Nima Gholami. He has begun the process of creating original art assets for the hundreds of individual projections. Here’s a short bio so you can get to know him! Nima Gholamipour is an Iranian-Canadian artist, animator, comedian and film maker living and working in Vancouver British Columbia. He is currently working as a part time artist at a mobile game studio and can be seen regularly performing improv and sketch comedy at various underground comedy shows in the city. One of his favorite scientists is Stephen Hawking. Who wrote the plays of William Shakespeare? Shakespeare himself? The Earl of Oxford? 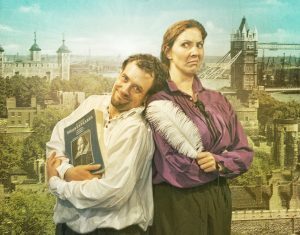 A horse?Monster Theatre’s Ryan Gladstone (No Tweed Too Tight, Every Story Ever Told) and Tara Travis (Til Death: The Six Wives of Henry VIII, Who Killed Gertrude Crump?) are back to get to the bottom of the debate as they bring their 2008 hit, The Shakespeare Show, back to Vancouver. After years of co-producing Monster Theatre solo works, they are STOKED to get back on stage together with the show that started their wildly successful partnership. Based on the greatest theatrical debate of all time, The Shakespeare Showinvestigates the theory that the plays of William Shakespeare were penned by Edward de Vere, the 17thEarl of Oxford. Just like one of his tragic heroes, Oxford sets his own tragedy in motion by using young Will Shakespeare, the boy who holds the horses outside the theatre, as a ‘front’ for his playwriting ventures. The result? Another “relentlessly clever, action-packed and intellectually satisfying”(Edmonton Journal) Monster Theatreadventure, complete with puppets, songs, swordfights and satire. Along the way we meet the Ghost of Christopher Marlowe, the Three Witches from Mac…ahem…The Scottish Play, Anne Hathaway, victims of the Bubonic Plague and Queen Elizabeth herself! 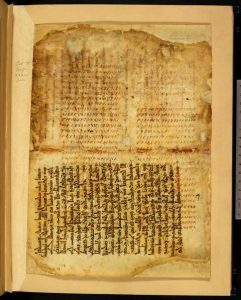 In the end, Oxford is killed and charges Shakespeare to tell his story – hence, this… “The only play e’er writ by Will Shakespeare”. 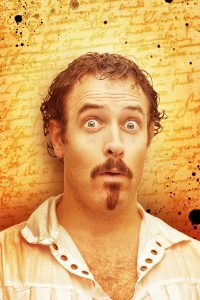 Written by Monster Theatre’s Artistic Director Ryan Gladstone, The Shakespeare Show is largely in iambic pentameter and almost completely in rhyming couplets. Directed by Karen Hamm, this fast-paced physical comedy features Tara Travis and Ryan Gladstone playing over 40 roles between the two of them! 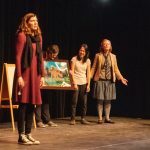 First produced and workshopped on the Canadian Fringe Festival circuit in 2008, The Shakespeare Show won Pick of the Fringe in Vancouver and has gone on to play numerous regional theatres across North America. 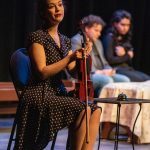 A beautiful score is supplied by violin virtuoso Drew Jurecka (Jeff Healey Band, Sarah Slean, Vinyl Café), and Fight Choreography is supplied by Kevin Kruchkywich (Theatre Calgary, Arts Club, Vancouver Playhouse, Citadel).